Just this week, Google introduced a new feature: instant preview for ads. When you conduct a Google search, you’ll notice a magnifying glass now appears to the right of the title of all search results — both paid search and organic search. When you click on the magnifying glass next to a search result, you’ll see an instant preview of the site pop up. The preview includes a downsized image of your landing page, plus a call-out that Google has generated to highlight a particular piece of information on the page. With the introduction of the instant preview feature, potential site visitors can now preview your site before they click your ad. This means the appearance of your landing page is more important than ever. What’s more, the connection between your ad and your landing page must be blatantly obvious. Whatever you promise in your ad must be readily apparent on your landing page. 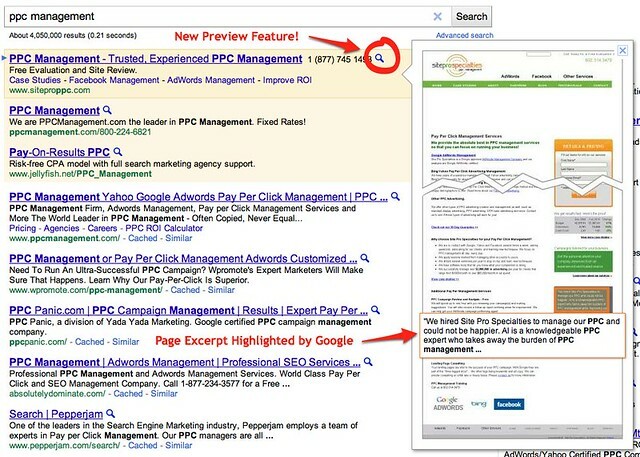 You may see a reduction in clicks from unqualified searchers — therefore a reduction in ad spend. The clicks you do get may be more qualified than they were before — resulting in higher conversion rates. And you can now use your landing page design as a way to increase CTR — potentially making it worthwhile to create a landing page for each ad group. Of course, I haven’t tested this call to action yet, and it may take some time for the majority of people to understand and use the instant preview feature. But at some point, I expect advertisers to emphasize the instant preview feature in the ad itself (unless Google prohibits it).